The Bridges of Madison County is far from being a great movie, but it’s very nearly a perfect movie—in its own way. What it does, it does very well indeed, and it wisely doesn’t try to do any more. Its virtue is its simplicity; this is a film about a housewife, a wandering photojournalist, and the four-day affair that changes both their lives. The action never strays beyond the dusty roads and lonely landscapes of Madison County, and most of it takes place in one very ordinary farmhouse. Sounds like a TV movie, you think? Well, it is very much like a superior TV movie. Then again, what’s wrong with that? TV movies get a bad rap. After all, there is a place in this world for melodrama, and most of the action of life doesn’t happen on battlefields or space shuttles or desert islands. It happens in living rooms and dining rooms and bedrooms. This film is about adultery, but I don’t think it glorifies adultery. Robert Kincaid (Clint Eastwood) is a National Geographic photographer who comes to Madison County, Iowa, to take pictures of its bridges. He asks directions of Francesca Johnson (Meryl Streep), a housewife whose husband and children are away at an agricultural fair. The hospitable offer of an iced tea leads to dinner, which leads to intimate conversation and then to physical passion. Soon both Francesca and Robert are faced with the question; what happens next? The main story is framed by the story of Francesca’s children, after her death, dealing with the revelation of this affair in a written manuscript their mother leaves them. This is by far the weakest part of the film and it would be better off without it. Michael and Carolyn start out as stereotypical small-town hicks, narrow-minded and intolerant. Their mother’s story has a profound effect on them, but not (as the film seems to think it is) a good one. They makes salacious jokes, get drunk together, and wonder if they’ve missed out on all the extra-marital fun. Admittedly, they do get beyond that initial reaction later in the film. But the whole idea of a mother describing her infidelity to her children—in glowing terms, too—is rather sickening. I liked that this film is not just another swipe at small-town life, or the supposed prison of the family. True, we are given a typical scene of wagging tongues and moral bigotry, when Robert Kincaid witnesses a local adulteress being ostracised in a local diner. True, we are shown a family dinner scene where Francesca’s attempts to make conversation fail miserably. And Robert Kincaid is presented as a glamorous figure who thrills Francesca with his unconventional ideas and tales of faraway countries. The story is not manipulative, or simplistic, but it works. Neither Robert nor Francesca are presented as especially noble or even likeable, and the reality of what they are doing is never softened or excused. But we still find ourselves sympathising with their plight, and only the hardest-hearted viewer will have no need of hankies at the climactic moments. 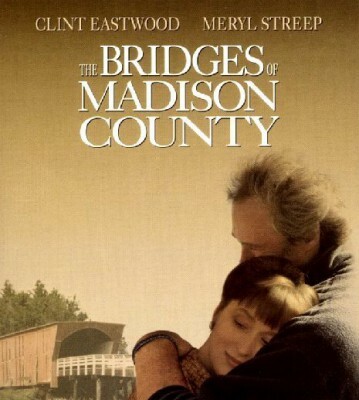 But I think the thing I liked most about The Bridges of Madison County was its setting. This is the same world, both small and vast, that Stephen King sets his stories in; roads that seem to go on forever, perpetually-chirping crickets, hazy blue skies, dust clouds rising from big tyres, and old paint peeling on wooden walls. “You’ve got it all right here”, says Robert Kincaid at one point. “This is as nice a place as any I’ve ever been”. For that insight, we can forgive him a little for being such a shallow seducer.